Fantasy diehards yearn for another Class of 2014 receivers to infuse their rosters with playmakers. Unfortunately, this year’s crop of performers does not come close. There is plenty of depth at the position, but not an elite game breaker. There is no unanimity among scouts, personnel offices and draftniks in regard to the top 12 players available. Looking at rankings across the industry, evaluations vary wildly. The only agreement is that there are many more slot and Z-receivers available than classic X (or split end) prospects. Without question, speed and size often separates the college all-star from a professional superstar and cannot be ignored when evaluating players. Six indicators—Career Receptions, Yards per Reception, percentage of Team Passing Yards, 40-yard dash, 3-cone drill and 20-yard shuttle—among future receivers provide additional insight into long-term NFL potential. Listed below are profiles on the top playmakers as well as their benchmark stats to assist in identifying potential stars as professionals. Ended campus tenure among the top receivers in school history: third in yards (3,220) and second in touchdowns (31). Named First Team All-AAC in 2016 and 2017. Over past two campaigns, produced back-to-back 1,000-yard receiving seasons: 1,246 and 1,017. Scored 32 career touchdowns. Recruited to campus as a safety and converted to receiver. Played basketball for former coach Larry Brown in 2015-16. At 6-foot-3 and 218 pounds, tall with long arms and a muscular body. Adept body control and can make the acrobatic catch. Wins 50-50 matchups with size and strength. Very nice catch radius and will be a red zone threat. Out muscles defenders and uses body to shield opponents. Long-strider’s deep speed and strong hands. Physical after the catch and breaks tackles. Burst and vision to find the open field. Good blocker in the run game. Has lined up in the slot and on the outside at SMU. A good, not great, hands catcher who makes some hand-eye mistakes and needs better concentration and mechanics to develop. For a bigger athlete, worthy quick-twitch skills. Recorded very good athletic scores at Combine. Must improve route running, mechanics and focus. Graduated with a degree in Sports Management in December. Despite size, not an elite prospect like Julio Jones or A.J. Green. Extremely high-ceiling, low-floor prospect: Could be a 1,300-yard playmaker or a 600-yard backup in a limited role. At kickoff last season, not on the national radar of scouts. After a terrific crusade, climbing prospect rankings and draft boards. In 2017, Big 10 Receiver of the Year and First Team All-Conference. Made 35 consecutive starts and recorded a catch in 33 straight. 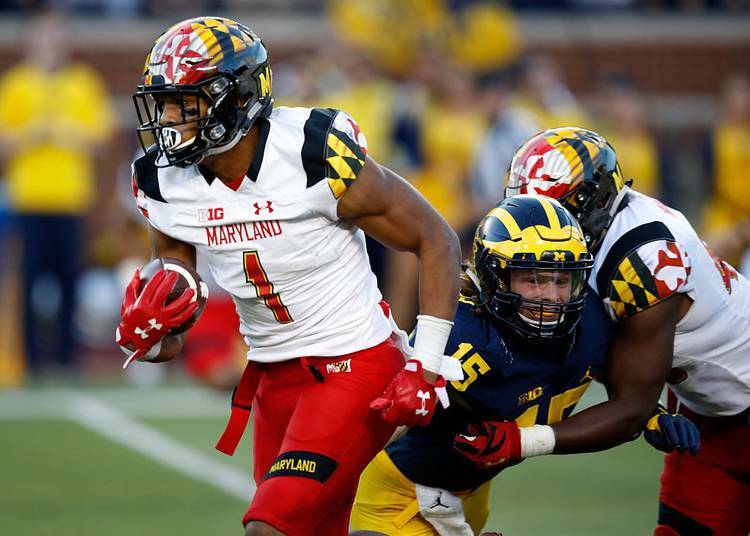 Established Maryland single-season record with 80 receptions and only third player in Terrapins history over 1,000 yards receiving. Acquired an astonishing 53% of team’s passing yards last year. At 6-foot-0 and 210 pounds, powerfully built and stout frame with boundless ball skills. Quick-twitch athlete with strong burst, inordinate agility and robust physicality. A shifty receiver who makes clean cuts. Gains immediate separation. Terrific balance and toughness. Solid route runner with flashes of elite deep speed. Great runner underneath the defense. Explosive playmaker after securing the ball. Accumulates lots of yards after the catch. Solid hands but tends to allow ball into body. Operated on the outside at Maryland but projects as a slot receiver. Willingness to block will entice teams. Lacks length and leaping ability and gets pressed into the sideline. Does not always catch cleanly and some head-scratching drops. Watching tape, comparisons to Steve Smith jump off the film. Versatile receiver with diverse skill set to play inside and outside. Lined up all over formation: X, Z and slot. Finished Crimson Tide career second in receptions and receiving touchdowns (19) and third in receiving yards (2,781). In 2015, established freshmen school records with 89 catches and 1,045 receiving yards. In 2017, averaged a career-best 16.3 yards per catch, paced team with 15 explosive receptions of 20-plus yards, totaled 41 catches for a first down or touchdown and named First Team All-SEC. Caught at least one pass in all 44 games. A wiry frame at 6-foot-0 and 189 pounds. Incredible combination of smooth athletic skills and explosive playmaking abilities. A great pass catcher and fluid route runner with marvelous speed and reliable hands. Easy transition in-and-out of breaks without slowing down: Changes directions effortlessly. Deceptive speed and quickness with long legs and fantastic footwork to create separation. Attacks the stem on the route and eats up cushions. Hunts the ball in the air and speed to get over the top of the defense. Garnered many touches on screens, reverses and jet sweeps. Instinctive athlete and prodigious competitor. Finds holes in zone coverage. Like many Alabama receivers, underutilized in college, playing in a run-first scheme. Defensive coordinators rolled coverage and cheated safeties over the top to stop Ridley. Good but not great size: Slender build and long arms. Does not have the size or strength of former Alabama stars Julio Jones and Amari Cooper. 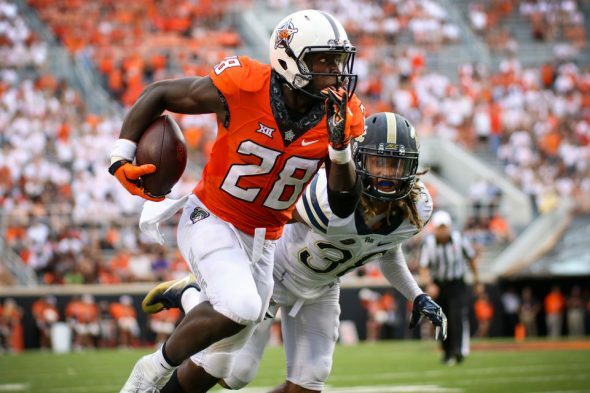 Highly productive and decorated playmaker at Oklahoma State. Stupendous Senior Bowl week. Registered three consecutive 1,000-yard seasons (1,087, 1,380 and 1,549), notched double-digit touchdowns (10, 10 and 13) and averaged over 20-yards per catch over the last three years. In 2015, scored four times beyond 70 yards. Totaled 39 career touchdowns. Named All-Big 12 First Team in 2016 and 2017. Named Biletnikoff Award winner last year. At 5-foot-11 and 213 pounds, homerun hitter in the Cowboys’ spread offense. Thick and solid build: Top-heavy frame and looks like a running back. Plays bigger than size indicates with extremely long arms, strong hands, large catch radius and very good hand-eye coordination. Twitchy athlete. Natural hands catcher with great footwork. Incredibly athletic and makes gymnastic-like catches. Fights off defensive backs to gain separation. Always competes and does not take plays off. Tracks ball extremely well deep downfield. Spins out of tackles and jettisons upfield. Adjusts well to the ball in flight. Runs like a running back in the open field. Worked in the slot and on the outside. Performed in a wide-open spread attack and needs time to learn a complete NFL route tree. On shorter patterns, improved footwork and aggressive handwork required in order to become more effective. A combination of Golden Tate and Will Fuller as a prospect. In 2017, First Team All-SEC All Purpose and Return Specialist, and Second Team All-SEC Wide Receiver. Led FBS with three punt returns for touchdowns in 2016. Over 900 yards receiving all three years on campus (1,009, 928 & 919). Returned 6 punts and a kickoff for touchdowns during career. A top high school recruit who made an immediate impact as a freshman in a jam-packed receiver unit. At 5-foot-10 and 201 pounds, strong and solid frame. Outstanding body control, displays good leaping ability, and first-rate agility. Consistently outran opponents: Difficult to tackle one-on-one. A terrific competitor with an ample combination of agility and toughness. Elusive and dangerous open field runner. At the snap, good release and gains optimal positioning with disciplined footwork: Runs quick and worthy slants. Good route runner. Rapidly gets in and out of breaks. Stretches the field vertically and does not fear venturing into the middle of the defense. Tracks the deep ball well and corrals the pigskin with natural and strong hands. Catches poorly thrown passes. Dynamic returner who can help a club from kickoff on special teams in September. Often lined up in slot, but ran a diverse route-tree for the Aggies. Does not always catch ball cleanly. Not a noteworthy run blocker. May struggle to gain separation. Projects as a slot receiver with potential to play the Z-position. A high-ceiling and high-floor competitor. One of the most exciting playmakers in college football over the past two seasons. 2017 AP All-American First Team. 2017 and 2016 All-American Conference First Team. Dominated team’s passing yards each of the past two seasons: 34% (2017) and 36% (2016). In 2017, set school records for receptions (96), yards (1,462) and touchdown receptions (18). Finished career with back-to-back 90-catch, 1,400-yard crusades, 3,590 receiving yards and 39 touchdowns. Shined in track and field as well as football in high school. No scholarships and decided to enroll at Memphis. Walked onto the team and earned a scholarship through hard work and dedication. Redshirted and injured shoulder the following season. In 2015, finally dressed and played with future first-round pick Paxton Lynch. At 5-foot-11 and 201 pounds, excellent burst off the line and tremendous footwork. Gains immediate separation. Stupendous combination of hands and body control. Makes difficult catches look easy. Very good route runner. Lined up in the slot and as an X & Z-receiver. Diverse route tree: Runs deep patterns, screens and crossing routes from all positions. Employs the sideline to his advantage. Plays bigger than size indicates. Good teammate and no apparent red flags in background. Missed Senior Bowl after suffering a Lisfranc fracture in the Liberty Bowl. Comparisons to Steve Smith and T.Y. Hilton are warranted.